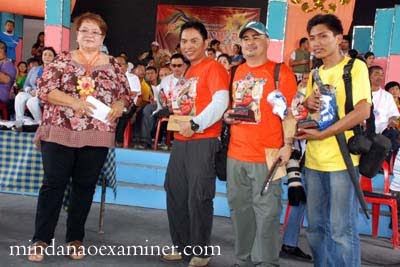 SARANGANI, Philippines (Mindanao Examiner / May 7, 2011) – The town of Maitum in Sarangani province in Mindanao celebrated its 12th Binuyugan Festival and 52nd Founding Anniversary with the most prestigious photo safari contest in the region. On its culmination day Saturday, the celebration was filled with colorful floats and street theaters uniquely depicting Maitum’s cultures through street dancing. Binuyugan is local term for unity. “The Maitum photo safari contest is now on its 7th year and is going strong, sustained by donations of our friends from here and abroad,” organizer Elizabeth Palma Gil said. “This year, we also award the Photo of the Year by choosing the top three photos out of the top ten best photos,” she said. Cocoy Sexcion of Sarangani Information Office bagged the Discover Maitum category with P10,000 cash prize, trophy and gift items from Smart Communications. Sexcion also won the Photo of the Year with Jesus Tinapay from Davao Camera Club who got second in the same category with P8,000 cash, trophy and gift items from Smart Communications. 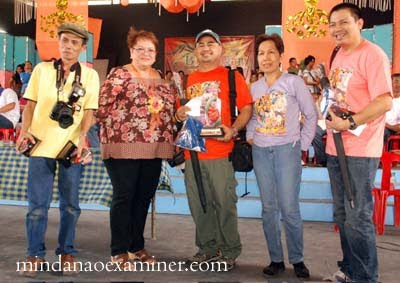 General Santos City Camera Club’s Alfonso Pading got first prize in the Bangsi Festival category with P10,000 cash prize, trophy and gift items from Smart Communications. Pading also won second prize in the Discover Maitum category with P8,000 cash, trophy and gift items from Smart Communications. Other winners of the P6,000 cash prizes, a trophy each and gift items from Smart Communications are Ritchie Eli Tongo of Sarangani Vice Governor’s Office for the Bangsi Festival category and Omar Gallinero of General Santos City Camera Club for the Discover Maitum category. “Cocoy Sexcion has been a consistent winner for the past years. Next year, he will be given the “Hall of Fame” award and is no longer qualified to join in any of the succeeding contests,” Palma Gil said. “Cocoy Sexcion is too big for the local photo contest. I want to see him climb up the ladder of photo competition to the national level or even higher. He has really moved up from being a photography student of mine in the past,” judge Bobby Timonera said. Eight judges were selected all over the country to judge the contest. “The contest is generally good and the photographers just did fine, doing minimal tweaking of their entries allowed in photo journalism,” Timonera said. “Though I haven’t seen photos on water tubing among the entries which were supposed to complete the exhibits of entries to really show Maitum’s wonders,” Timonera said. “I see a better and more comprehensive photo contest in Maitum with the dynamics the organizers have been doing. Maybe a series of photo contests in a year can be done to really come up with the photo of the year,” he said. Maitum is Sarangani’s farthest municipality, an Ilocano enclave with as much love for agriculture as their knits in Northern Luzon. Ilocano families from Luzon began to settle here before it was founded as a municipality in 1959. Also as a coastal municipality, thousands of its communities depend on fishing. The marinated bangsi (flying fish) is Maitum’s one town - one product.